Just like you apply sunscreen to protect your skin — you also need to think about protecting your vinyl boat seats from the effects of sun, weather and time. In this all-hands-on-deck blog, we will walk you through some of the best ways to protect your boat’s vinyl upholstery to prevent future needs for vinyl seat repair and to keep it looking as good as new! Spray a light coat of vinyl seat cleaner directly onto the seat and let it sit for about a minute. In the meantime, organize your cleaning supplies. Now that the cleaner has sat a bit on the surface, take the soft brush and work over the vinyl in circular strokes, applying very little pressure. Vinyl is tough, but the 303® Multi-Surface Cleaner does the work for you. Go over the entire surface of the seat in segments. Use the towel to remove the dirt and grime that the cleaner loosens. When it comes to the piping and down into creases, use the toothbrush, just as you did the soft brush. Spray the cleaner directly onto the brush. Then follow with a clean section of towel. 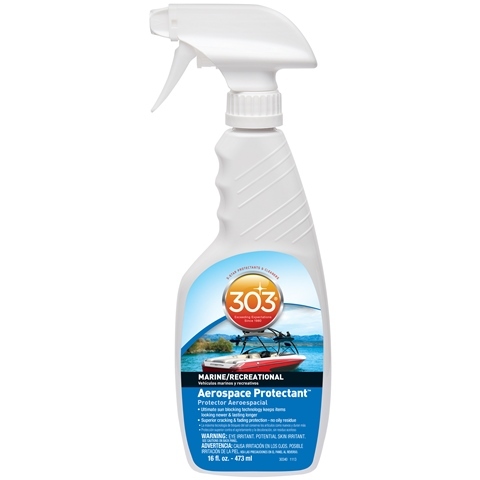 After your vinyl boat seats have been thoroughly cleaned, protect them with a product like 303 Aerospace Protectant. Safe and effective for rubber, vinyl and plastic surfaces, this product provides superior UV protection to prevent fading and cracking of the vinyl, repels smudges, dust and other stains, and leaves a dry, matte finish with no greasy feel. Spray the protectant on the cleaned vinyl surface, and wipe the area completely dry. For greater bonding and longevity, buff a few times with a dry cloth. Be sure to follow this cleaning and protecting protocol every time you use your boat and, when your boat is sitting, at least weekly. Doing so will help ensure that your boat’s vinyl surfaces stay clean, protected, and looking beautiful for years to come! Vinyl, while strong, sometimes is not strong enough. Either you’ve bought a boat that was not well cared for, or someone sat in the seats with a sharp tool in his or her pocket — and now your boat’s seats are damaged. Holes, rips, cracks, and tears happen. To help keep water and salt out of the inside of your upholstery, replace damaged vinyl as soon as possible. What is the best way to store my all white interior in garage while I pull the floor and redo it? I thought about cleaning it with the products you mentioned above then wrap them with shrink till season starts up again? Hi Chad, what type of material is it? Leather, vinyl, fabric? Please let us know at marketing@goldeagle.com and we can recommend the best products to use. Thanks for sharing useful tips for PROTECTING BOAT VINYL SEATS. A nice tips shared by you about these. I will also follow steps shared by you and also use product like 303 Aerospace Protectant. but i am also suffering from Pink stains in m y boat seats and cushions. Can you have any idea how to remove pink stain from seat covers without changing it? Hello! 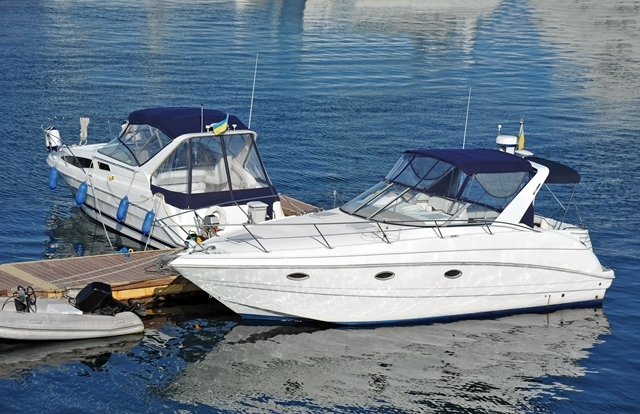 Yes, you can use regular STA-BIL® Storage in your boat. However, it will not help prevent/remove water in the fuel. We recommend the STA-BIL® 360 Marine for that purpose. If you have any other questions please contact consumer support at producttechsupport@goldeagle.com. Thanks for sharing this useful information about to protect vinyl boat seats. 303 Aerospace Protectant may useful but i want to know in how much area of pink stain it cover in 1 bottle show in pictures. how do i keep my vinyl toliet seat from cracking? Always Keep the boat seat dry. Never coverup boat when its seats and cushions are wet. Because a wet seat with warm moisture cause pinking on seats. And always keep your seats clean, never use any vinyl cleaner which harms seats. Will this product help to prevent mildew stains after I have thoroughly cleaned vinyl golf cart seats that were once white, but turned spotted black? I have used many cleaners and elbow grease to get them white again.